Home / airlines / analysis / tips / Who charges least convenience fee for flight ticket booking? Convenience fee has become a necessary evil. The amount you see in first screen while checking airfare is never the amount you pay. The final amount charged will always be a few hundred rupees to few thousand rupees more. Why is convenience fee charged extra? Airlines work on wafer thin margins. Every cost component is broken down and separated. A fancy restaurant probably has a profit margin of 20-40% or even more on the amount you pay, so they can afford to pay 2-3% to banks as transaction fee when you swipe the credit card. But airlines prefer to skip including the transaction charge upfront as it serves two purposes- one they can keep the initial amount low and appear cheap and second, since transaction charges could be different for different modes of payment, including it upfront may not be right. But what should be the right convenience fee? 3. Few customers will notice it but they have to travel anyway, so will be forced to pay the convenience fee as there's no other option or almost all airlines charge similar amount. 4. Only very few like opportunistic travelers like me try to assess the trip is still worth even after the huge convenience fee and decide not to proceed with ticket booking as 20% convenience fee on Rs 4500 ticket is not making economical sense and I have no compulsion to travel to specific destination. 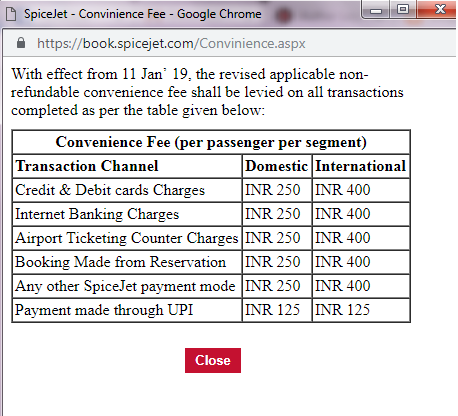 Above: Spicejet has revised its Convenience fee- now costs Rs 800 on an international flight round trip. But you may be able to save this fee by using Gift Card option. I think banks only care about total amount transacted- they don't care if it is one way ticket or return or if there're 2 passengers or 4, domestic or international. Airlines have made it convenient for themselves by charging convenience fee per flight per user, instead of keeping it as a % of total amount payable. Now they are trying to milk more from international travelers, by charging another 100-150 extra one way for international tickets. Makes me lean more towards Srilankan, AirAsia etc who have a more favorable convenience fee terms. Another possible thought: Airlines are probably considering worst case scenario- like max fare on any domestic ticket is around 20000, so 2% of 20000 is 400, so airlines charge this flat amount even when amount payable is much lesser- penalizing cheaper ticket buyers. I can understand online payment incurs a transaction cost- but why for airline counter or sale counter? If I am booking say 4 return tickets on SpiceJet, the convenience fee adds up to Rs 2000. It is cheaper for me to take a taxi, go to their sales office in Chennai or airport counter in Chennai and pay in cash. But they charge convenience fee for cash payment also, which defeats the whole purpose because despite undertaking inconvenience of having to physically reach the counter, I am forced to cough up extra. If they've decided to charge a fixed fee irrespective of mode of transfer, they should ideally factor it in base fare and avoid this last screen shocker. Credit cards are the most expensive form of payments for merchants, because banks and payment gateway charge a commission on transaction plus there is a long credit period (like 45-60 days) before the amount is actually realized. Net banking on the other hand should be low risk and quicker, so some vendors charge less for net banking transaction. Disclaimer: All amount as spotted during my check. Fees and charges may vary from airline to airline over time depending on multiple factors. Use your discretion. Jet Airways convenience fee is a function of ticket fare. Up to 20000 INR it is Rs 300 per ticket, for tickets priced 1 lakh and above it is Rs 1500. So expect a minimum Rs 600 extra cash outgo on whatever fares they advertise. They seem to be the most expensive of all airlines in terms of convenience fee. You can check Air Asia's convenience fee here, they don't charge it as a % of fare but a fixed fee for sector and depending on payment type. Paying by net banking is a bit cheaper at Rs 99 whereas credit card payment costs Rs 340 more, still cheaper than most rivals. International flights have a different rate card! Rs 250 per flight,per person, adding to minimum Rs 500 per return trip per person, irrespective of mode of payment (only UPI is cheaper). Earlier they used to charge Rs 100 per person, per flight-now increased to Rs 250 during sale, Rs 225 otherwise. For a low cost ticket (like Rs 1000 one way) convenience fee of Rs 250 is like 25% extra- very inconvenient indeed. Spicejet customer care used to provide a phone banking option through which there was no convenience fee. Not sure if it is still possible- reaching the customer care is often tough. A pdf document on Air India website claims a convenience fee of Rs 25 per person per ticket will be charged- this is cheapest of the lot and most reasonable. But I tried checking on the site- selected a destination, put some name and went till payment page- couldn't see the amount going up. May be they will include it only while processing payment? Vistara charges Rs 150 per return ticket for credit card payment. Fair amount I can say. Easemytrip gives a coupon code that negates the convenience fee value. But be careful to compare the ticket fare with airline website- sometimes the fare will be higher on Easemytrip. If it is same or less and you can save on convenience fee, then Easemytrip is great option. So far Air India and Air Asia has the best model for convenience fee. Air Asia are truly the masters of low cost aviation. Other airlines can learn a thing or two from Air India and Air Asia. Jet airways, Make My Trip and Spicejet are most expensive when it comes to convenience fee. There was a news that convenience fee will be abolished- unfortunately nothing like that has happened. Next time you book your ticket, pay close attention to the convenience fee. Don't let the initial amount fool you. The total amount you pay is what matters. Did you have any specific experience w.rt convenience fee? The convenience charge has always been a hidden charge which we get to know after we decide to book and the discounts offered in the beginning becomes meaningless as we end up paying more becoz of convenience charges. Yes.. 20% is too much. IRCRC has best model for transaction costs. I recently booked a Air India flight without convenience fee. Paid through credit card. They bait your minimum amount but once you reach payment page they will add tax,Convenience fees etc summing it into huge amount.